After an unforgettable 10 years together, Carl Gilbertson knew he had to treat his wife Laura to a memorable anniversary, too. 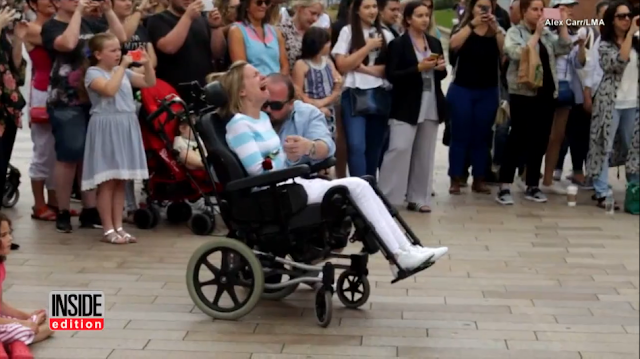 So he took Laura, who has multiple sclerosis, to a shopping center near their home in Liverpool, England, and surprised her with her very own flash mob singing Bruno Mars' love song, "Just the Way You Are." In the emotional video, students from the Liverpool Media Academy serenade Laura as a crowd gathers. Gilbertson kneels beside his wife's wheelchair and gently puts his arms around her before they share a kiss. It was a bold gesture, but Gilbertson said his wife is well worth it. "What happened on Saturday was nothing in comparison to how she makes me feel every day," he told InsideEdition.com. Gilbertson met his wife when she was 21, three years after she was diagnosed with MS. At the time, she did not exhibit the effects of the disorder, which affects the brain and spinal cord. "Through her working life she'd had one or two relapses but we led a very normal life," he said. But shortly after they returned from their Florida honeymoon in 2006, she suffered another relapse. "Unfortunately this one wasn't as easy to recover from and within a few months of marriage she'd had to retire from work and was in the wheelchair," he said. But their marriage remained unshakeable. "The last 10 years have been about Laura never giving up and fighting back every step of the way," he said. With their tenth anniversary nearing, Gilbertson enlisted the help of an old friend to surprise his wife. Last December, he was out shopping when he ran into Stephanie Carr, a former elementary school friend who's now the director of musical theater at Liverpool Media Academy. He told her that Laura loves anything musical and enjoys watching videos of flash mobs so he wanted to combine the two. He had a song in mind but asked Carr to help with the rest. She told InsideEdition.com that she was more than happy to step in. "He's just amazing, it's just like complete and utter love," she said, adding that Gilbertson even helps his wife put on her makeup. "He says she's the one who has to put up with him." And when Carr asked her students from LMA to help with the surprise, they were thrilled, too. "They said 'of course!'" she said. After two rehearsals, about 30 students in their teens and early 20s gathered at a mall, Liverpool ONE, on Saturday and waited anxiously for the couple to arrive. One choir member handed Laura a rose before they burst into song. "[I felt] absolute pride to do such a lovely thing for such a lovely couple," Carr said. "I stood back and cried the whole time. To see Laura's reaction was so special." They also called upon a young local filmmaker, Alex Carr, and his friend, Milo McAleny, to catch the surprise on camera. Their video captures just how moved Laura was by the performance. "As you can see on the video, she was a little overwhelmed," her husband said, "but she's watched it back an awful lot ever since. I think she's enjoying everyone enjoying her video — even if I think it's a little weird!"